Backing up the files you've stored on your hard drive is one of the most important tasks for any computer owner. Nobody wants to lose their music, photos, emails, documents or spreadsheets because of a computer glitch, virus or unexpected hardware failure. I've written about Free Backup Software for those who want to use local storage, such as an external hard drive. But if disaster strikes, your backup can be lost in a flood, fire, hurricane or tornado. That's why it's smart to consider online (cloud) backup as an alternative, or in addition to, local backups. Mozy, one of the earliest online backup services, has seen so much success that it’s done away with truly “unlimited” storage space. Instead, Mozy has implemented a tiered pricing structure based upon how much data one stores on its servers. The result, for one admittedly extreme customer, was a monthly bill that could have exceeded $2,000! Naturally, he passed on that proposal and found another online backup service. Carbonite still offers truly “unlimited” plans, starting at $59 per year for basic online-only backup for one computer. Its Home Plus plan costs $99/year but includes the ability to backup your external hard drive, and can make image backups as well. The Home Premier plan ($149/year) includes all of that, plus a Courier Recovery service, so you can get a copy of your backup sent by mail, when you need to restore your files from backup in a hurry. All of the Home plans limit you to one computer, but Carbonite's Business and Business Pro plans let you backup multiple computers. All plans offer versioning, so you can restore previous versions of files you've backed up. Carbonite discourages extreme users with tiered bandwidth-throttling policies. The more storage space you use, the slower your file transfers. Carbonite, for example, will accept your first 35 GB at up to 2 Mbps. Between 35 and 200 GB, bandwidth drops to 512 Kbps. Above 200 GB, you’re limited to 100 Kbps. The result is that if you try to upload a large amount of data to your online backup, it will take a long time to get there. Just for fun, I did the math. If you've reached the 200GB plateau, uploading an additional 100GB of data would take about three months! If you upgrade to the more expensive "Business" ($229/year) and "Business Plus" ($599/year) plans from Carbonite, you won't have any data throttling when uploading to the service. UPDATE: Carbonite no longer throttles your uploads. Apparently, word got back to the folks at Carbonite about my comments here, and they decided to eliminate the throttling. Thanks, Carbonite! On the upside, there are some freebies offered by online backup providers. There's the MozyHome Free option, which gives you 2GB of backup storage. 4Sync offers 15GB of free space, and will sync your files across desktop, laptop, web and mobile devices. Carbonite's free offer is less enticing. Although it doesn't limit you on space, you have only 15 days of freeness to enjoy. See my article Nine Free Cloud Backup Services to learn how you can access over 150 GB of free online backup storage. Crashplan is a relative newcomer to the online backup scene. It offers free unlimited backup storage – using other computers in your home/office network. If you have two or more computers in your home, you can install CrashPlan on each (Windows, Mac or Linux) and use your local network to do mutual backups. Or, use your friends’ hard drives and the Internet to do free backups. You can invite other people to join you in a peer-to-peer network powered by Crashplan’s backup software. Basically, all of you share some of your storage space for each other’s backups. Call it social online backup. Crashplan also offers space on its own servers, of course, and itâs priced cheaper than Mozy or Carbonite. Unlimited storage on Crashplan's servers costs just $4/month per computer, or $9/month for 2-10 computers. Crashplan does not throttle bandwidth based on storage space used, and offers the option to do your initial backup with a "seed drive". My article Free Online Backup With CrashPlan describes the CrashPlan offerings in greater detail, and also tells you how to use it to make free online backups with your own web server, if you have one. Choosing an online backup service is relatively simple for a single computer with a typical amount of data. But as you can see, it can get complicated as the number of PCs and gigabytes increase. I'd recommend Mozy, Carbonite or CrashPlan without hesitation. All of them are secure, high-quality offerings. For those who need 2GB or less of backup storage, Mozy's free option seems a no brainer. Carbonite can be a better deal than Mozy for those who need to backup more than 50GB. CrashPlan is less known, but the pricing is even better. And I think their free local/social options are very attractive for users who are willing to explore them. 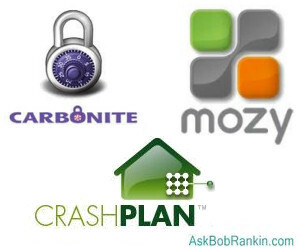 Most recent comments on "BACKUP: Carbonite, Mozy, or Crashplan?" A few years ago I used Mozy backup and found it very easy to use and not so expensive - until my hard disk crashed. Then it took me ages to get all the data back and it also cost me a lot to download it all. Now I have an external hard drive which I use for backups. I'd like to reiterate Rick Conley's comment. An external hard drive works out a lot cheaper than any "cloud" based storage. I bought a 2TB one for $129. Now do the math and tell me which makes the most sense. I've been using Carbonite since 2008. I find it to be a great service and perfect for my needs. I'm currently backing up around 60GB. I had a hard drive crash last Spring and was able to recover all my data via Carbonite. I recently discovered that they offer service for my Android device at no additional charge! Carbonite is now backing up all the photos and videos on my Samsung Galaxy S III, as well as offering a lost phone feature that will locate my phone, snap a picture of the perpetrator and wipe my data. I can also send a signal to the phone that will make a noise so I can find it nearby. I'm currently paying a fee to T-Mobile that includes that service so I'm planning to drop that and save myself around $4/month. Backblaze is very similar to Crashplan, and when I emailed both with questions, Backblaze responded much quicker. I suppose there are good reasons for using one of these services, but years ago I simply bought an ext USB drive. Now I have two, one at the desk and the other is off site. Once a month I swap them so the worst case would be losing a couple weeks of data. Ext drives are cheap and very fast. EDITOR'S NOTE: That's the rub... you need to have the discipline to have TWO backup drives, AND remember to swap them every week/month. You've also got to find a good, safe offsite backup location that's not likely to be affected by fire, flood, hurricane, etc. I have posted the theme of this comment possibly here and certainly elsewhere and had very little response. My point is: How do you upload a large amount of data for back-up (in my case, well over 160 gigs of music and documents), without driving a horse and carriage through an ISP's data cap and without it taking a year and a day to execute? I consider myself lucky that I now have fibre-to-the-cabinet here in the UK with a download of about 25 megs after years of lousy copper-wire snail-like speeds but the upload speed is still only consistently around 5 megs, so how can the upload feat be achieved easily? Cloud back-up seems to me to be impractical for a domestic user with limited resources. EDITOR'S NOTE: The answer is a "seed drive" or as Mozy calls it, a Shuttle Drive. For your initial backup, they mail you a drive, you load it up, and mail it back. What about Backblaze? I've been using that service for some time now and am very satisfied with their service. Quote: "EDITOR'S NOTE: That's the rub... you need to have the discipline to have TWO backup drives, AND remember to swap them every week/month." Not really. My backups are auto-scheduled so it happens in the background. Also, my email sends a reminder on the first of the month, so I don't have to remember anything, Also, my 200 gb drive would either cost a lot or take forever with these sites. Ext drive takes about 10 minutes. Obviously lots of PC users on here, because I haven't heard anything said about the built in backup plan for Apple. Apple's "Time Machine" can be configured multiple ways--I currently have mine on an external hard drive. It copies all file changes once an hour for a day, then once a day for a week, once a week for a month, once a month for a year. It only copies user files, not applications, but I believe that is the way mine is configured. Frankly, it runs in the background and I don't even think about it. I just looked at my screen and it is backing up my system as I type this! As the allocated drive space fills up, it deletes the oldest file. I currently have March 2011 as my oldest archive available. I won't swear to it--like I said, I don't have to even think about this, so I don't--but I believe it dynamically saves more versions based on number of files saved and size of the hard drive available. And I do know that Apple has a wireless networked version now available where you can have all your systems backed up automatically to a single drive. So for Apple users, this is pretty much a "set it and forget it" issue. I had a subscription to Carbonite for a year, but I switched to iDrive, and I'm happy I did. I left Carbonite because it screwed up so often: several times a month, I'd get a message that I didn't have files selected for backup (but of course I did). I'd have to uninstall and reinstall -- as often as I had to do it, it was a major inconvenience. A while back I took your suggestion to use JustCloud. This company is not ready for real time. On 3 separate occasions they couldn't find my account, their sync feature doesn't work and when I pointed that out I was told "we're working on it" with a tone that indicated it wasn't too important to them. It only took 3 emails and a phone call to get my money back- at least they say it is coming. EDITOR'S NOTE: I don't recall mentioning it. Where did you read about it? I've been using iDrive for about a year and a half. Works fine. I have 8tb of data. How long would this take on a 75mbps connection? I've been using Crashplan and it's fantastic. On my main computer I use their online storage and an external hard drive. Currently I have about 60GB of documents, photos, etc. reliably saved. I started uploading to Amazon Glacier it is very cheap and recommended if you have huge amount of data , I 've got a Zoolz Home unlimited account for 2 $ / month. Backed up 100 GB of photos with Carbonite three years ago. Went to do a restore after a disk crash and found that they had LOST much, if not Most, of my files. Carbonite totally stinks!! I used Mozy for a while when they first came out -- before Carbonite was popular. It was simple to use. Until I lost everything. It was a horrible experience, as someone else here posted, and took forever. Perhaps they've fixed that problem, but I moved on. Tried Carbonite for a few years, but it kept dying and stoving up my system with its resource usage. I was on the phone with 3rd tier tech support for literally 4 to 5 hours a month. In the end, a complete uninstall/reinstall worked. But I was tired of paying for backups that weren't happening. Hopefully, Crashplan will stay as trouble-free as it is now. Interesting article. I've been using RossBackup for 3 months now. I switched from Carbonite because their customer service stunk. I am paying about $4.00 a month (I used a coupon from FaceBook) and have backed up 3.1 TB already. My computer is running fine and The customer service is fantastic. Although it's a relatively new company, they have really given me no reason to complain.